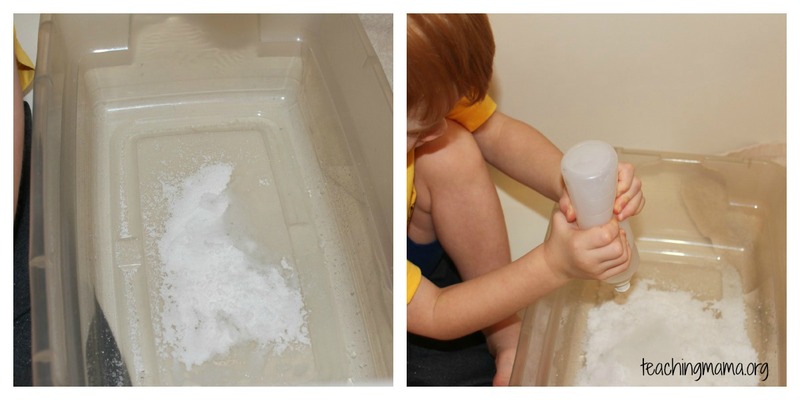 To begin, we put a container into the bath tub. I just wanted to make sure we didn’t get snow all over the place! This mama does not enjoy extra cleaning! 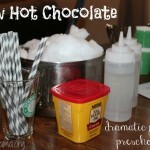 Then we added a few scoops of the powder and added water. 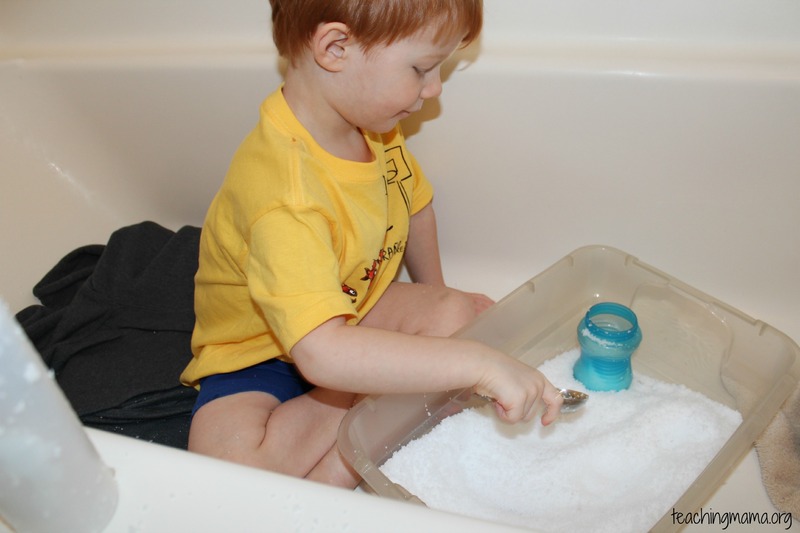 Next, the magic began…the powder began to expand and fill the tub. Troy’s eyes about popped out of his head! He was quite amazed! This stuff is really neat. It felt cold like snow, but super soft to touch. The only thing that is different from snow is that it doesn’t mold together to form balls. Something that is really neat about this product is that they say you can keep this forever. 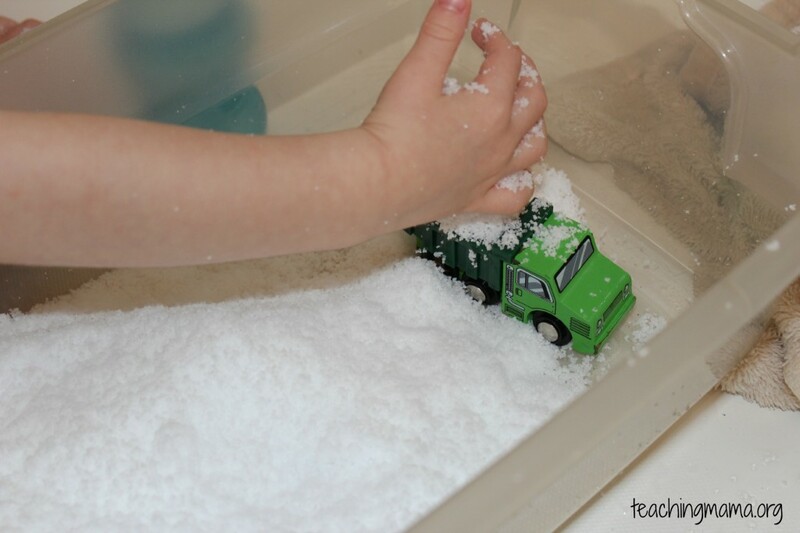 Once it gets dry after a few days, you just add water to it again to have it turn back to snow. I love the fact that it is reusable! 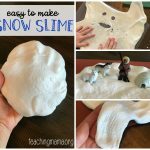 Insta-Snow is really fun to play with. It feels really soft to touch. Troy literally played with this for an hour straight without stopping. His imagination went to town. I didn’t tell him or guide him how to play with it, but he immediately started scooping, digging, filling up his dump truck all the while talking to himself. Next, I gave him the invitation to play with sugar cubes. 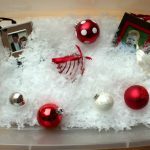 He turned them into packages that were buried and dumped in the snow. Then the trucks had to deliver them up the mountain. Very creative, if I may say so myself! Wes had a different way of playing with the snow. 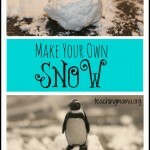 To make it easier, the boys played with the snow separately. Didn’t want to make a huge mess! 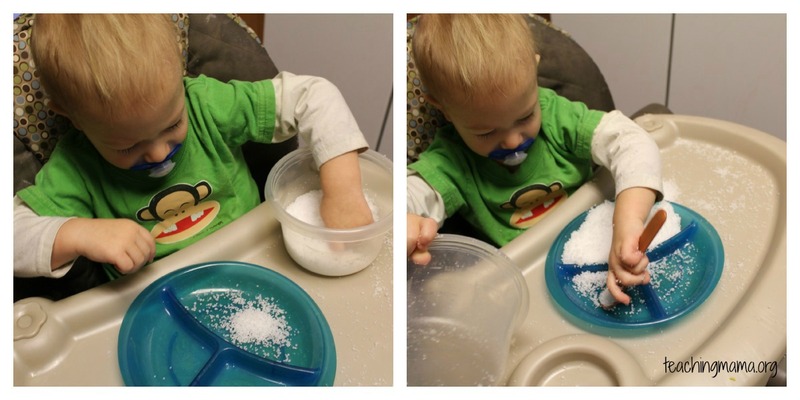 He played with it in his high chair and had a great time pouring and scooping as well! 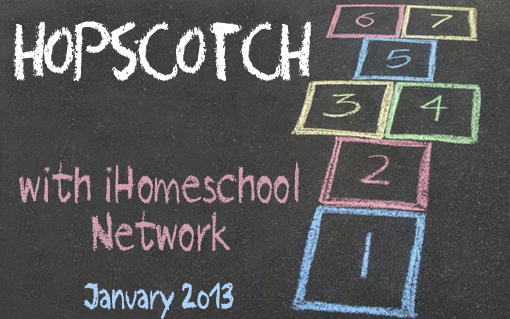 We did a couple other fun things with this activity. 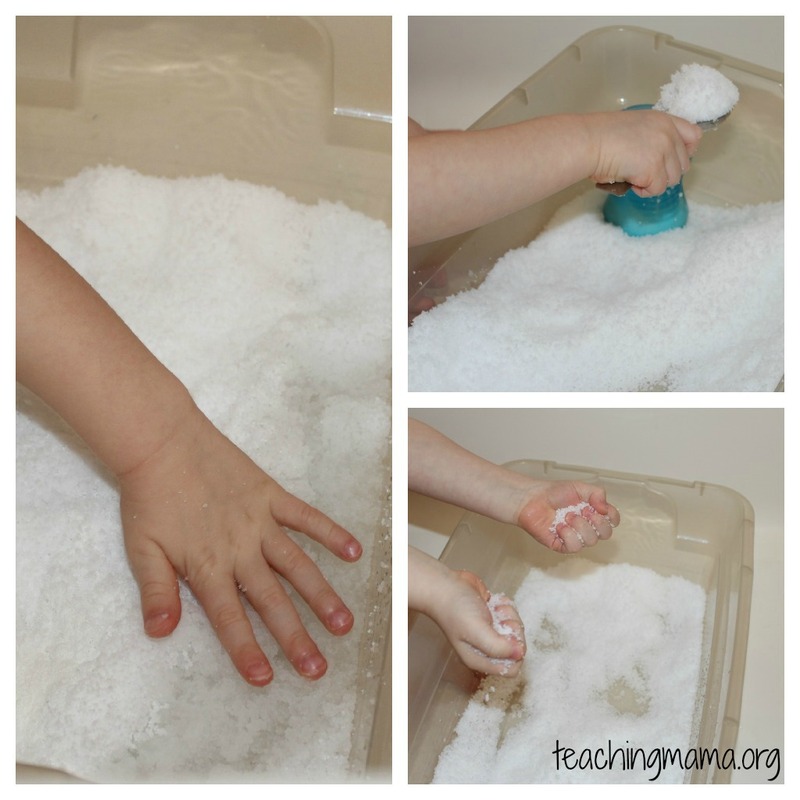 First, to add a different texture to the tub, we made large snowflakes that are made out of Borax. 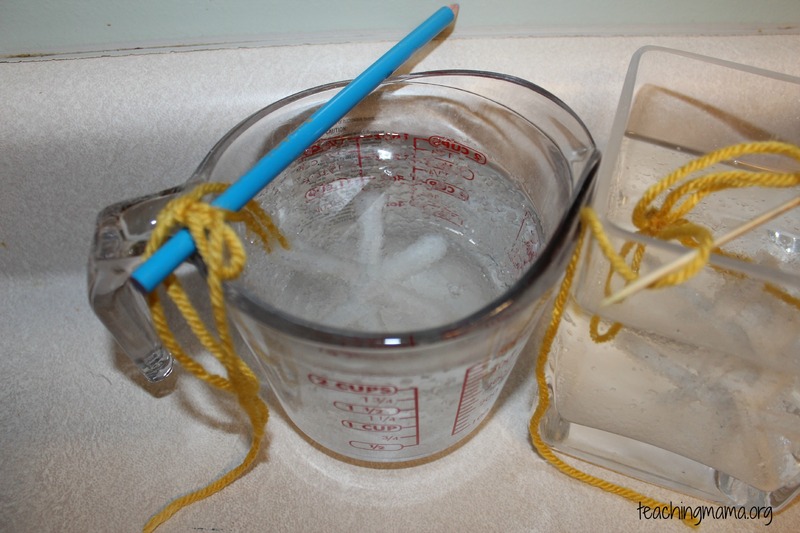 I followed this recipe and soaked the pipe cleaners all night in Borax and water. Pretty neat! 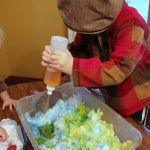 The only thing I must warn you about is that Borax is toxic, so make sure your little one DOES NOT eat it! 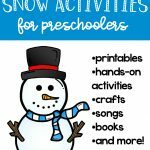 Thanks 🙂 It was fun for Troy to bury the snowflakes and feel the rough texture. 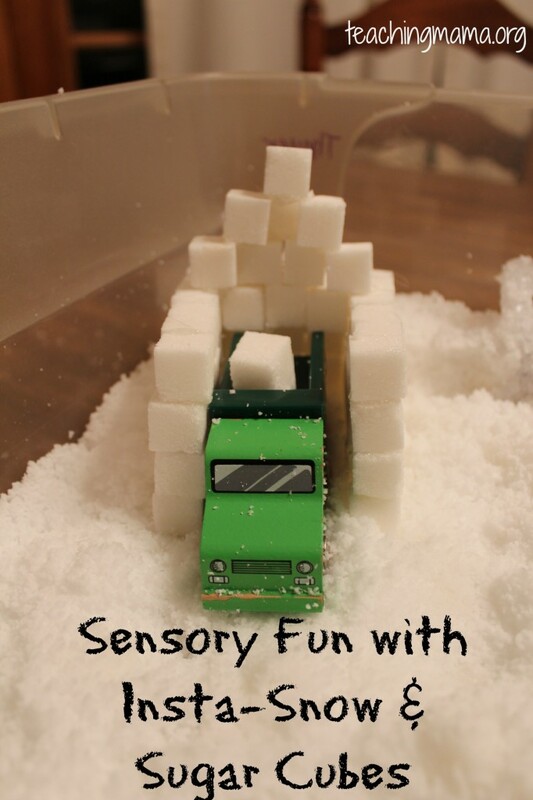 Lastly, we made a garage for our dump truck out of sugar cubes. 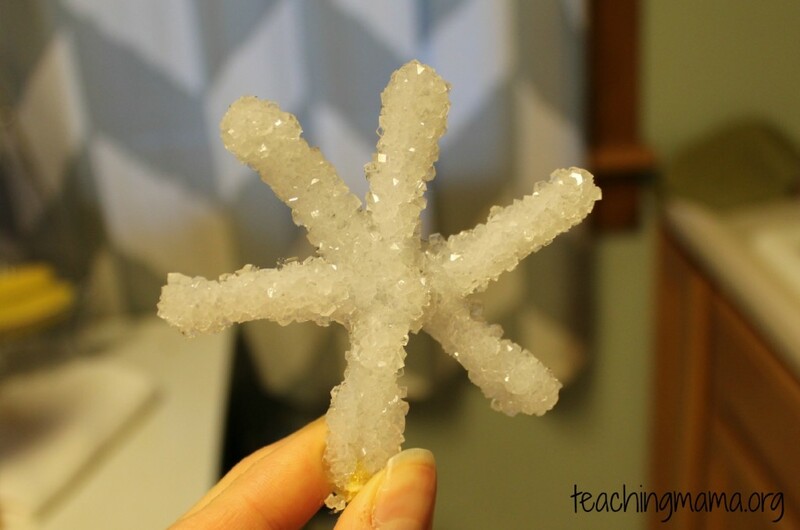 I used a hot glue gun to stick the sugar cubes together, since Elmer’s glue wasn’t cutting it! 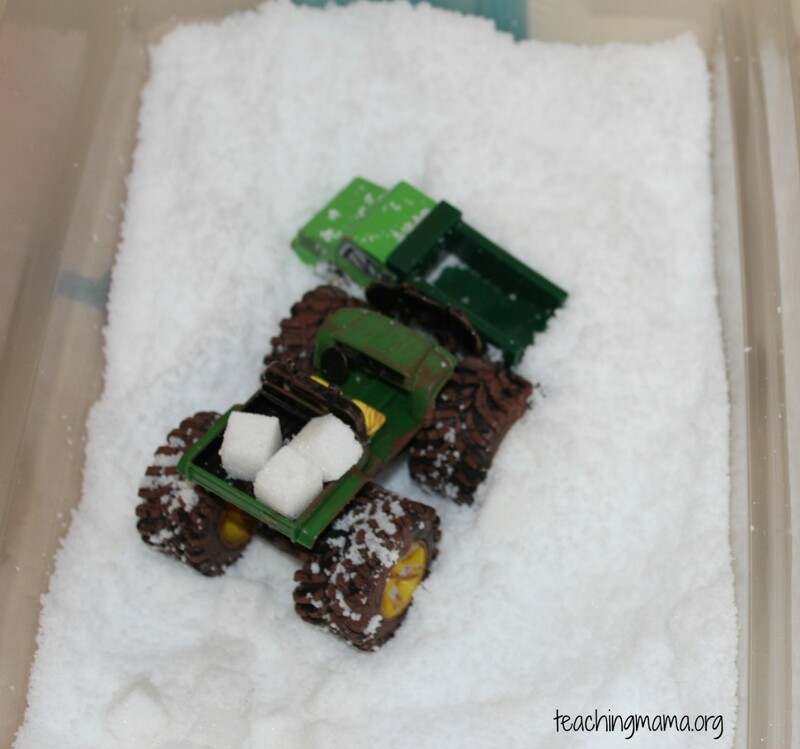 It was a great final touch for our snow tub. 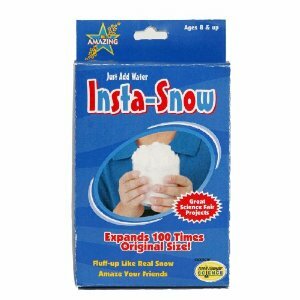 You’ve gotta try Insta-Snow out! Let me know how you like it! !